Couples share body contact while sleeping, and preen and scratch each other. 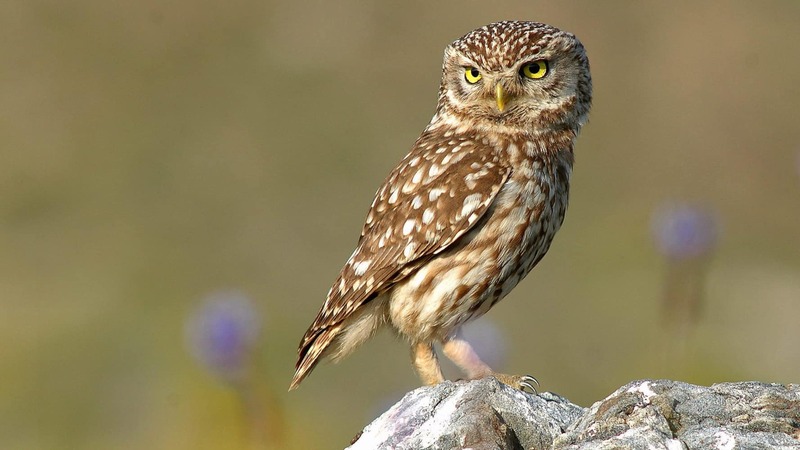 Little Owls have a plump body, a broad and round head, bright yellow eyes and bill, and spotted plumage. They are mostly dark brown with whitish markings over the entire body, these being more abundant around the breast and face than on the dorsal area. The tail is short, as are the wings, both tending to be round with whitish markings forming horizontal bands. Eyebrows are prominent and have a distinct V-shape patch on the back of the head. Males and females share a similar appearance, with males generally being smaller than females and with a lighter face. The young are paler and show less contrast in their colouring than adults. 10% of the sale price of this neckwarmer is donated to the environmental NGO Brinzal. For further information about the work carried out by Brinzal, take a look to this page. The European breeding population is estimated at 618,000 to 1,170,000 pairs, which equates to 1.24 to 2.34 million adult individuals. Since Europe hosts approximately 25% of the whole population, a very rough estimate of global population size would be 5 to 9.9 million adults. Athene noctua has an extremely large range, extending across Europe, Asia, and North Africa. Little Owls reach from the Iberian Peninsula and Denmark eastwards to China. In Africa they can be found from Mauritania to Egypt, and also along the coast of the Red Sea. In the Middle East they are found on the Arabian Peninsula. They were introduced historically to Britain, and more recently to New Zealand. Athene noctua inhabits a wide variety of landscapes. Its preferred habitat is open ground, with areas to perch, cavities for nesting, and a stable climate. This bird avoids dense forests. It can be found in open fields, grasslands, open woodland, steppes, semi-deserts, deserts, cliffs, non-wooded mountains, and ravines. It can also be spotted in agricultural landscapes and urban and suburban habitats. The Little Owl is a cavity-nesting species, meaning that it dwells in tree and rock cavities, cliff crevices, man-made structures, and even the nests, holes, and burrows of other animals. It can be found from sea level up to elevations of around 3,000 m, and on rare occasions up to 4,600 m. However, lowland areas are generally preferred due to milder weather. The mating season can begin as early as February and end as late as August, varying according to region. The courtship period starts with the male patrolling the borders of his territory, calling to fend off other males and to attract mates. Once a potential mate makes contact, pair bonding begins. They fly in pairs and sit in the same tree. The female makes a ‘begging’ call to her partner, and this prompts the male to feed her, indicating that there is enough food to reproduce and feed young. The male shows the female potential nests within his territory until she selects one. The nest is built in a hollow cavity, which is scraped out and cleaned before an average clutch of 2-5 eggs is laid. If the first brood is lost, a second clutch may be laid. The female incubates the eggs for about 25 days and broods the chicks for 1-2 weeks. During this period the male supplies food. After brooding, both parents bring prey back for the nestlings, as they begin to explore outside the nest. At around 21 to 35 days old, the chicks become fledged with parents continuing to feed and protect them for a further month. The young become independent and leave the nest when they are 2-3 months old. They start to reproduce the year after their birth. After the young have fledged, the bond between the pair decreases, and they may even separate. However, Little Owls show a high rate of mate fidelity. The partners will often fly together and hunt closely. They also share body contact while sleeping, and preen and scratch each other. Athene noctua is a sedentary and territorial species. The male normally remains in one territory for life. The boundaries may expand and contract, and are largest in the courtship period. Although it has been seen hunting and calling at daytime, the Little Owl is mainly active at dawn and dusk. Its flight is undulating and close to the ground. Athene noctua is a very vocal bird, having a repertoire of multiple calls. These calls are used to contact or attract mates, defend territories against enemies and other Little Owls, alarm, and communicate. Athene noctua feeds on insects (mainly beetles and grasshoppers), small mammals, birds, reptiles, amphibians, crustaceans, and earthworms. Prey is caught by swooping down or running after it on the ground. To carry its prey they use either the beak or claws. They often carry it towards holes where surplus food is stored. Portions of undigested prey are compacted internally and regurgitated as pellets. Predators of the Little Owl tend to be larger birds, such as other owls, falcons, buzzards, eagles, and kites. Small mammals, like genets or foxes, are also predators of this species. 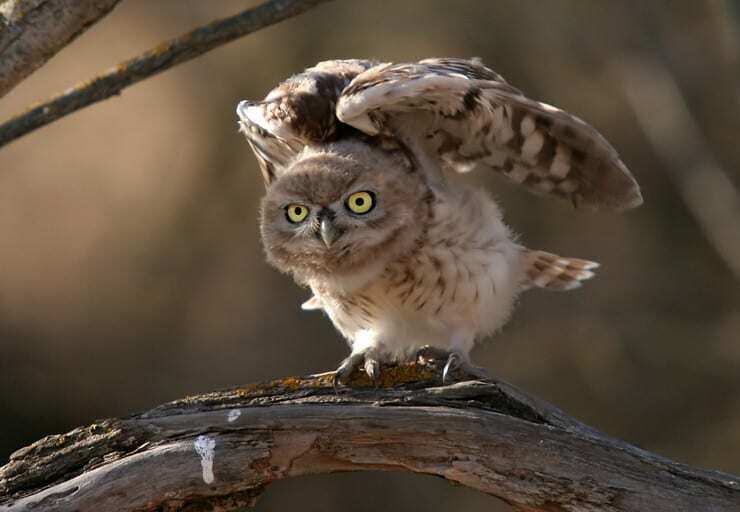 They call in response to predators, allowing other Little Owls to hide when the call is heard. When alerted, they bob their bodies up and down. When sleeping, camouflage is provided by positioning themselves in a way thatallows them to hide their light markings. The V-shaped marking on the back of the head mimics eyes to prevent predators attacking from behind. Average lifespan in the wild: 4 years. Lifespan in captivity: Over 10 years. 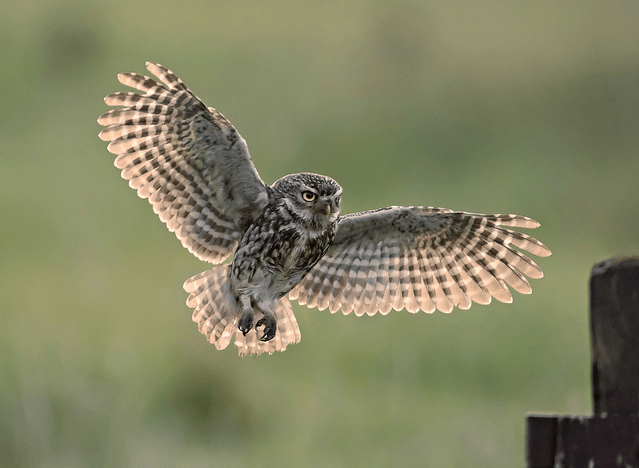 Although this is a very adaptable species and its population range and size are large, a decline has been documented throughout Europe, not only of the Little Owl, but also of other owls. The number of successful broods per pair is very low. 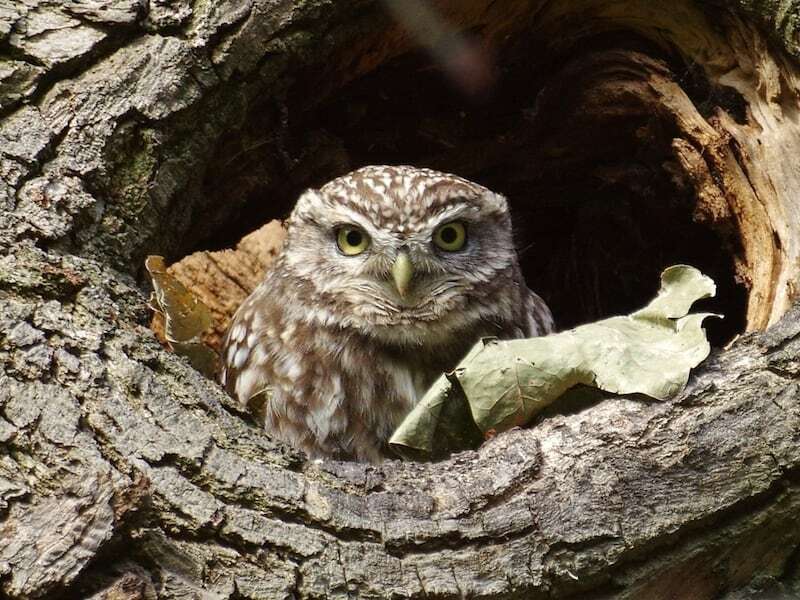 The main threat for Athene noctua is a decline in available prey and nesting-sites due to industrialised farming practices, pesticides, agricultural intensification, ground clearance, felling of old hollow trees, and the restoration of old buildings. Severe winters and road traffic deaths also contribute. Athene noctua is perfect for the study of owl decline. This is because it is well known to the public, is present in significant numbers, and responds quickly to conservation interventions. For instance, nesting boxes provided in some parts of its range have boosted numbers. 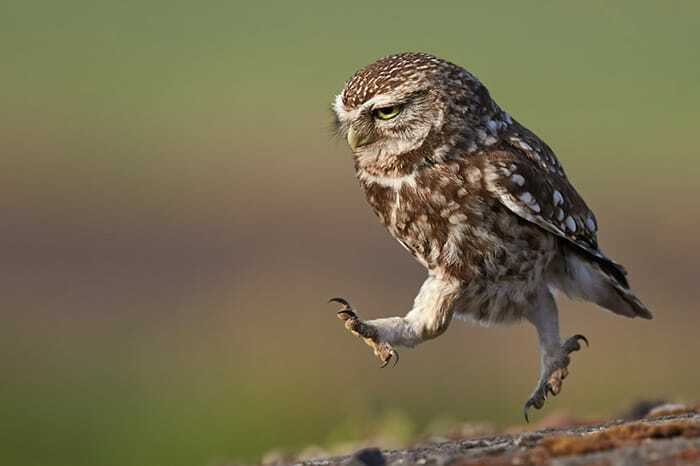 Little Owls are known to catch prey equalling its own weight. Food is sometimes hoarded by this species, with some caches containing as many as 30 items for later consumption. Males are the main food providers during the breeding season, which can be linked to their lighter weight, allowing them to move further and faster. Also the heavier weight of the females possibly helps them in the task of caring for and defending the nest. Like many other owls, Athene noctua turns its head from side to side in a curious manner, probably to focus on an approaching object. Little Owls were traded to hunt small birds and have even been used as domestic pets. Athene noctua takes regular sand baths, and has even been spotted bathing in smoke rising from chimneys.